While some of the smaller details are sometimes overlooked when planning for function, cosmetic details such as design patterns can make a significant impact on the look of your new deck as you entertain throughout the summer. As you design your new deck, it is important to consider every facet of your design, from elevation level to lighting accessories. While some of the smaller details are sometimes overlooked when planning for function, cosmetic details such as design patterns can make a significant impact on the look of your new deck as you entertain throughout the summer. Whether you are repairing an older deck or starting from scratch with a new design, consider these design pattern options for your outdoor entertainment space. 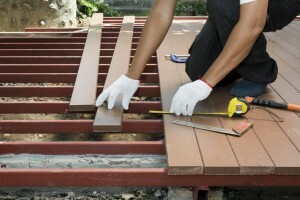 Creating the flooring design pattern to be parallel to your house creates a consistent directional look for your deck. Parallel designs are often preferred for square decks for a simple yet clean look in an outdoor space. Angled designs create a contrast between the horizontal lines of siding or brick while flowing in one single direction across your deck. If you are interested in adding flair to a simple deck design such as a square or rectangular shape, angled designs can add direction and style to the overall look of your deck. Herringbone Decking frames your design around a single focal point on your deck for a clean yet adventurous look in your space. This type of flooring can also be used for specified sections of your deck to add a central focus an element of style to your deck design. This design pattern offers the look of the parallel flooring with an exterior frame to highlight the perimeter, often of a different shade or direction. While the outside of the design frames the perimeter of the deck, the internal parallel decking offers the same simple yet consistent look as the parallel design. Similar to the look of the single picture frame design, the double picture frame offers the side by side look of two parallel designs with an exterior frame. This adds stylish contrast to an otherwise simple single picture frame design. Custom inlay designs allow you to further customize the look of your deck with a unique design framed by an exterior perimeter. Particularly for decks with a more complex design, a custom inlay may be an ideal option for a more sophisticated deck design and style.